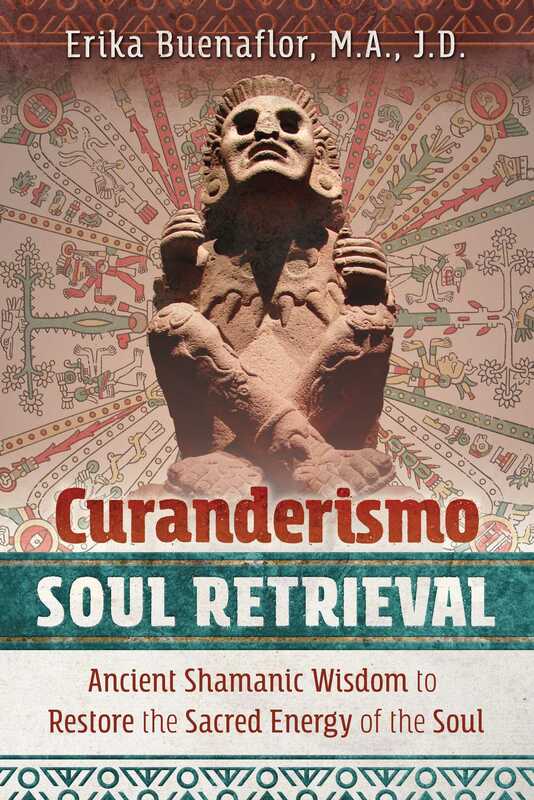 Drawing on her more than 20 years’ experience working with present-day Mesoamerican curanderos/as and the ancient shamanic healing traditions of the Mexica and Maya, Erika Buenaflor, M.A., J.D., provides a step-by-step guide for the curanderismo practice of soul retrieval. She explains how the soul is a form of sacred energy that can escape when someone experiences trauma or is threatened by challenging and stressful situations. Its absence can be responsible for a host of negative conditions including physical ailments, depression, insomnia, and dysfunctional behavior patterns. Exploring how to retrieve this sacred energy, or soul fragments, as well as resolve cases of soul theft, the author details how to journey through the non-ordinary realms of the Underworld, Middleworld, and Upperworld to locate lost soul fragments and reintegrate them. She explains how to enter a trance journey, providing instructions for shamanic breathwork practices, shamanic dancing, sounding and toning methods, as well as hand postures (mudras) to facilitate trance states. She explores how to perform soul diagnosis, create a loving and nurturing space for soul fragments to return, and work with the healing wisdom of the 5 Mesoamerican cardinal directions: South, West, North, East, and the Center, which marries the other directions and offers a portal to other worlds. She offers pressure point exercises to release the energies of traumas and contemplative exercises to continue the reintegration of soul fragments after the trance journey. She also explains how to connect with animal guardians to aid you in the soul retrieval process. Revealing how to achieve a lasting retrieval of soul energy, Buenaflor shows how the dynamic process of curanderismo soul retrieval can heal many forms and degrees of trauma and help people move forward in life with more clarity, self-awareness, empowerment, and greater depths of authentic self-love. Similar to ancient Maya and Mexica understandings, the South is a path that can be somewhat unpredictable and challenging. But dedicated devotion to our spiritual development, healing, and awareness always tempers and can overcome any difficulties and excesses. Many of the ancient Mesoamerican associations with the South still hold for soul retrieval work, but now we will be applying these understandings to help us with our particular modern Western issues. The South is both the path to and serves as our internal Underworld. It is where we go from within to discover, understand, and heal lost soul pieces, the cause(s) of our lost soul pieces, when the losses happened and why, shadow aspects, undisciplined excesses, and neglected and unloved aspects of ourselves. It is also the space where we begin to comprehend what we need to learn and integrate and how we can truly honor our lost soul pieces and move forward. Moving forward on this path of healing, introspection, and self-awareness can eventually serve as our own resurrection and rebirth, wherein we create a loving and healthy space for our soul piece(s) to come home to. In the soul retrieval process, the principal sacred essence energy that the South has to offer is a fruitful path of personal discovery, self-awareness, and understanding. To obtain the greatest benefits in working with the South, it is important to comprehend that the South, or any of the other cardinal spaces, is not simply defined by or limited to the time and space we allot for trance journeying to their realm. If we allow it to be, the wisdom and medicine of the cardinal spaces, in this case the South, can intersect into our seemingly mundane world, and bring synchronicities into our lives that will allow us to further understand the questions we have posed that are integrated into our energetic subtle bodies. This will allow more of our soul pieces to return. Each time a soul piece comes back, we get more energy to persevere and create ideal realities for ourselves. Before journeying into the South choose and create a space you feel comfortable in, and cleanse it. Cleansing spaces generally allows for deeper journeys. One easy way to cleanse your space is to place some copal on a charcoal burner. The copal cleanses spaces, and acts as an offering to the spirits of the South. Begin the journey by thanking the wise Teachers of the South for welcoming you into their sacred space and helping you discover and understand whatever is necessary for the journey. Start by inducing a slight trance state. You can engage in any of the suggested ways to go into a trance state: shamanic breathwork, shamanic dancing, drumming, rattling, or using sound frequencies. If you can induce a trance state quite readily, the tools may not be needed. Nonetheless, you may choose to incorporate them with the understanding that these tools encompass your own personal sacred soul retrieval ceremony. It is your journey so create it in a way that complements your life and preferences. This shamanic breathwork exercise is ideal to slow down brain wave activity and enter into a deep trance state, and of course, drumming, or any of the other shamanic tools also work. The Mudra is Chok (to sprinkle). For Chok, the index, middle, ring, and pinky are together and slightly curled in, both hands are in chok mudra. The right hand is above the head with the arm gently extended up, elbow slightly bent, and the left hand is between your navel and sternum. With a slow inhale switch the position of the hands, so the left hand is now above the head with the arm gently extended up elbow slightly bent, and the right hand is between your navel and sternum. When the hands have switched positions, take 3 sharp breaths out the mouth contracting the abdomen while doing so. Repeat this for at least 3 minutes. Thereafter, take 7 slow inhales and exhales in and out from the nose, feeling the heartbeat slow down as you inhale and exhale. Once you have achieved a trance state, set the intention to journey into the South. When your consciousness navigates you into the South, you can call upon your power animals or other guides to take you to your lost soul piece or you can simply permit yourself to search for this lost soul piece. The whole time you are in this space notice your surroundings, and take note if you can tell which non-ordinary realm you are in. • When did you leave me? • Why did you feel you have to go? • What do you have to teach me? • What do you and I need to be healed? • How can I honor you? • How can I look after you? • How can I help you feel safe? • How can I love you? • What, if anything, can I do to create a space within me that you want to come home to? • Are you ready to come home into our sacred heart? Erika Buenaflor, M.A., J.D., has a master’s degree in religious studies with a focus on Mesoamerican shamanism from the University of California at Riverside. A practicing curandera for over 20 years, descended from a long line of grandmother curanderas, she has studied with curanderas/os in Mexico, Peru, and Los Angeles and gives presentations on curanderismo in many settings, including at UCLA. She lives in Tujunga, California.